I'm from New England. This IS how you say it and spell it. Here’s a recipe for a New England classic made vegetarian and gluten free. Of course, you can still use bacon for the extra richness or add lobster for a decadent summertime delight. See variations below. A traditional chowder might use a roux -- equal parts butter and flour cooked to a paste -- for thickening, but I’ve found that a purée of fresh corn kernels plus potatoes cooked down into the broth create the exact same result and help the chowder maintain it’s fresh light consistency rather than becoming gelatinous. Note: this chowder will also work well with leftover previously cooked corn on the cob. Just remove kernels from cobs and use both as if they were fresh. You might not extract as much flavor from the previously cooked cobs and the kernels won’t be as crunchy in the chowder but it’s certainly a great use for leftover corn on the cob. 1. Cut corn kernels from cobs. Using the back of your knife, scrape the remaining kernels and juices from the cob. Set aside. 2. Boil 3 cups water with 2 teaspoons sea salt and add cobs (with kernels removed) and bay leaf. Simmer for 10 minutes. Drain and reserve liquid. Discard the cobs and bay leaf. 3. In a soup pot, heat the olive oil on medium high heat until it shimmers. Add diced onion and a pinch of salt and sauté until soft, about 3 minutes. 4. Add potatoes, another pinch of salt, dried thyme, and cayenne if using, and reduce heat to medium. Cook for about 5 minutes or while you prepare the liquid. 5. Put about a cup of the reserved corn stock and 1 cup of the corn kernels into a blender. Blend until smooth. Alternatively, you could just add the corn kernels to the liquid in a large measuring cup and purée with an immersion blender. Add this liquid to the pot and simmer for about 20 minutes or until potatoes are very tender. Season to taste with salt and black pepper. 6. Add remaining corn kernels and cook for about 4 minutes. 7. Add milk and thyme, and warm until liquid just begins to steam. Be careful not to boil the milk. Season to taste with salt and pepper. Serve with an additional pat of butter, if desired, and minced parsley leaves. With Bacon: At step 3, render the bacon until crispy in the soup pot. Remove bacon strips and lay on paper towels. Drain excess grease so that you are left with about 2 tablespoons in bottom of pan. Sauté diced onion in the 2 tablespoons of bacon fat and continue with recipe. Add roughly chopped bacon bits to the chowder just before serving. With Lobster: At step 7, add previously cooked and shelled lobster meat, cut into bite sized pieces, with the milk and thyme. To freeze: After adding the corn in step 6, remove from heat and allow to cool. Freeze the partially finished chowder at this point. To reheat and finish, simply defrost in the fridge or in a pot over low heat. Bring to a simmer and ensure potatoes are heated through. Add milk and thyme and continue with step 7. After nearly 2 weeks of cobbled together childcare, camp mom, and family "vacation" my older son is finally back at day camp. So I'm sifting through the options of lunches to pack for my little vegetarian. PB & J is off the table since this camp has a no-nuts policy. Uh oh! Challenge accepted. Since we've been down this road before and had to get pretty creative in summers past, I thought I'd share some of these ideas with you. Links to some of the recipes mentioned are also below when you click the photo. Now if only I had accurate photography for all of this. The boxed lunch is rarely photogenic and there is rarely time to snap a pic when hustling out the door. In the comments, please share your favorite vegetarian nut-free camp lunches with us! Also, if you think your kid won't eat many of the items listed here, just try it. You never know what they'll start to like because they were starving and had no other option but to eat what was in their lunchbox while at camp. 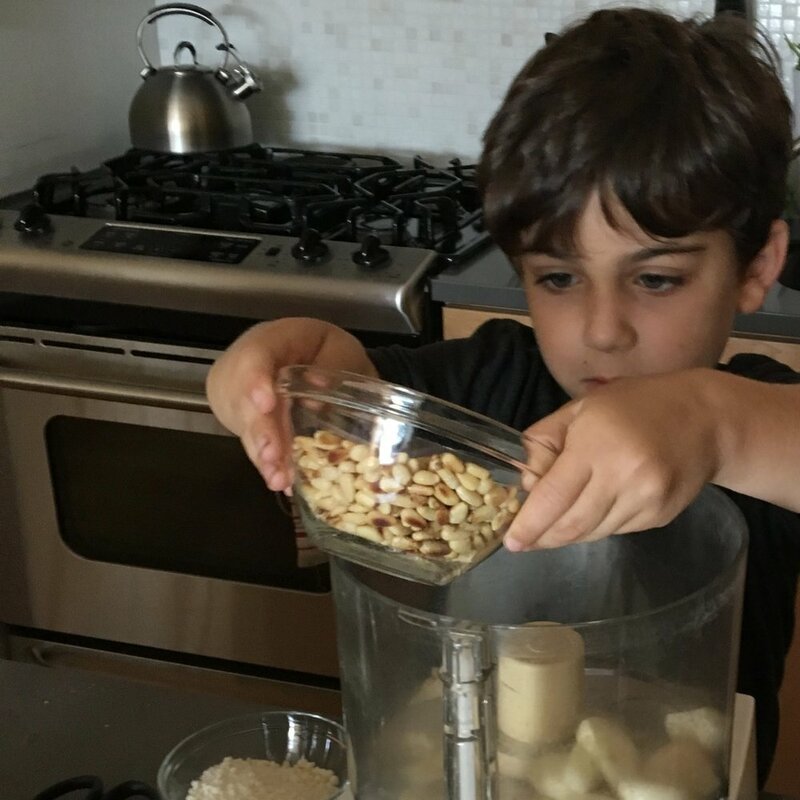 Recently, I've found myself answering lots of questions -- from cooking class students, fellow CSA members, and other parents -- about radishes. So I'm delivering on an overdue recipe post promise. These tightly packed peppery spheres produce passion. Previously, I was passionately opposed to radishes, which caused me to diligently leave bunches on a certain colleague's desk (you know who you are), but then I discovered how to prepare them. At this point, we generally only make them one way, because this is how a certain 5-year-old (he knows who he is) will have it. Pickled. Which, when mentioned in my house, will provoke a high-pitched squeal and the "yummy dance." I get it. 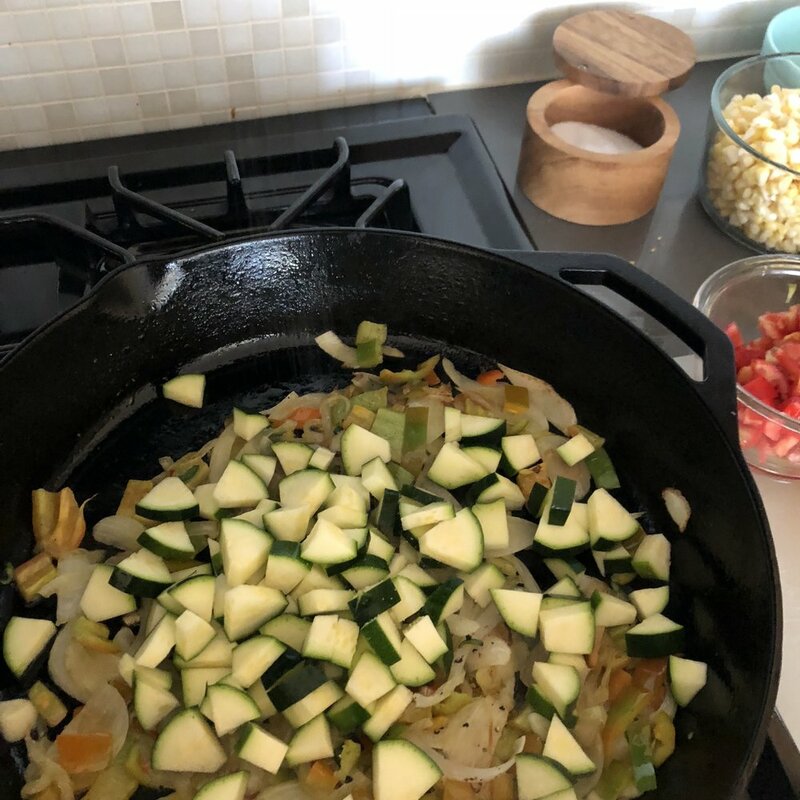 But I feel like I'm cheating for my older son's vegetable appreciation because they are probably the easiest thing I make for him. One bunch of radishes usually fills a half pint jar. Use this jar to measure out the vinegar, about three-fourths full. Put that in a small pot and heat it with the honey just until the honey dissolves. While this is heating, thinly slice your radishes and pack them into your jar with the spices. Pour hot liquid over the top. Put cover on and refrigerate. These are best after one day but can be eaten in one hour or kept for weeks. I've never processed them to be shelf stable because the aforementioned 5-year-old eats the entire jar in 3 days. 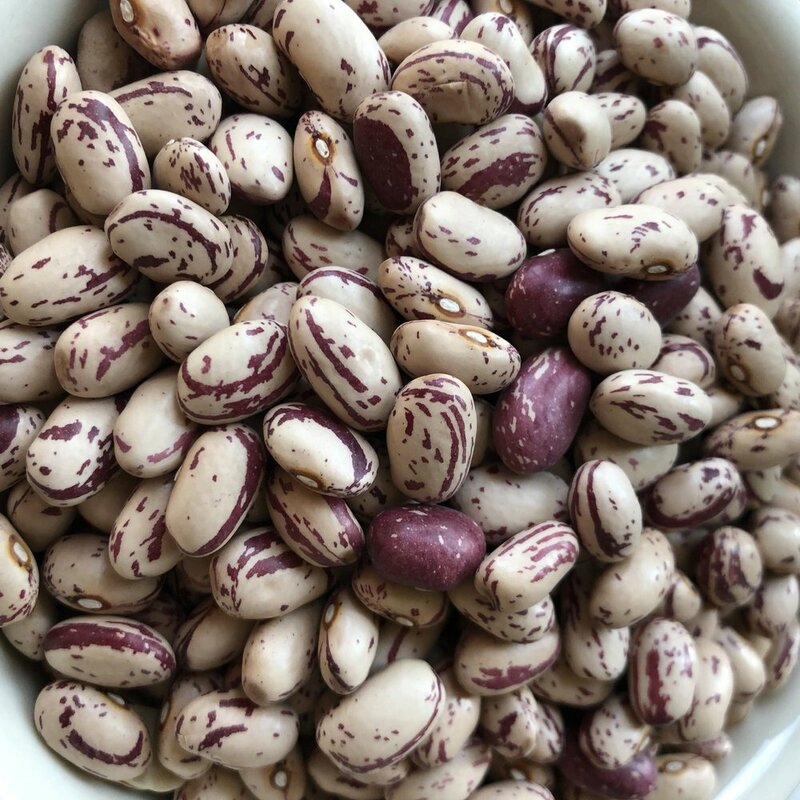 Warning: they smell a little funky, but taste delicious and are a great addition to toast smeared with chickpea or fresh green pea hummus, or a salad, sandwich or taco. Maybe you're not so into pickles? Try these other great applications for your radishes. Butter Braised: Scrub radishes, remove stems and tips. Cut into quarters. Put in a small pan and cover by an inch with water. Add a few pinches of salt. On medium-high heat, cook until nearly tender and water is mostly absorbed, adding more water if needed. Add about 3 tablespoons butter for each bunch of radishes, and cook stirring frequently until radishes are tender and slightly browned. When you add butter, you can also add your choice or dried spices or finish the dish with chopped fresh chives or parsley. Roasted: Add cleaned, trimmed and quartered or whole radishes to a roasting pan with chicken and onions. Occasionally toss the radishes with the chicken drippings. Potato Hash: Add diced radishes to your hash along with other root vegetables. Top with runny eggs. Slaw: Shred or julienne radishes and combined with shredded cabbage, carrots and/or cucumbers and dress with a light citrus vinaigrette. Tip: for stable cutting of a radish or other vegetable with a rounded edge, slice off a tiny piece on one side to create a flat surface for your sphere to rest on your cutting board. You can assemble it in a matter of minutes. It can be used immediately, saved in a jar and eaten throughout the week or frozen in batches for a February day when the herb plants have all but dried up. It's kid helper-friendly. Little hands are great at plucking leaves from stems and can help blend items safely in a locked food processor. Pesto has endless applications: top fish before baking it, thin it out and use as a sauce to spruce up a protein presentation, mix into a pasta, risotto or other grain dish, dress some zucchini "noodles", spread on a sandwich, mix into scrambled eggs or quiche, or top a soup. Once you have this basic formula for pesto, you can make all types with whatever leaves you have. Put all that stuff in a food processor (like one of these), and just let it go. If you want to be more technical, purée the leaves, garlic and nuts first until ground, evenly sized, and well combined. Scrape down the sides, replace the lid, and then process again while streaming the olive oil into the mixture slowly. Add cheese, salt, and pepper at the end to taste and process again until evenly incorporated. Some recipes suggest adding lemon juice or zest which provides a nice balance of flavor. However, be careful with the acid. It will turn your greens to a less appetizing olive color. If at all, only add right before serving and not if you plan to store your pesto for any length of time. You can also mix and match herbs and nuts. Play around with it. There are few rules in pesto. What tastes good to you? What combinations do you use? I attempted to grow a few things this summer. Overall it was a big flop. Between the lingering spring frost, weeds, rodents, and gnats, my garden was doomed. So I decided to focus on what I could control and invested some time and research into growing my herbs. For the first time, I actually re-planted my herb plants into spaces big enough to accommodate their sprawl. I took it to the gnats, inserting glue traps in all of my indoor pots, and re-potting them in clean fresh soil after shaking off the gnat infested soil. 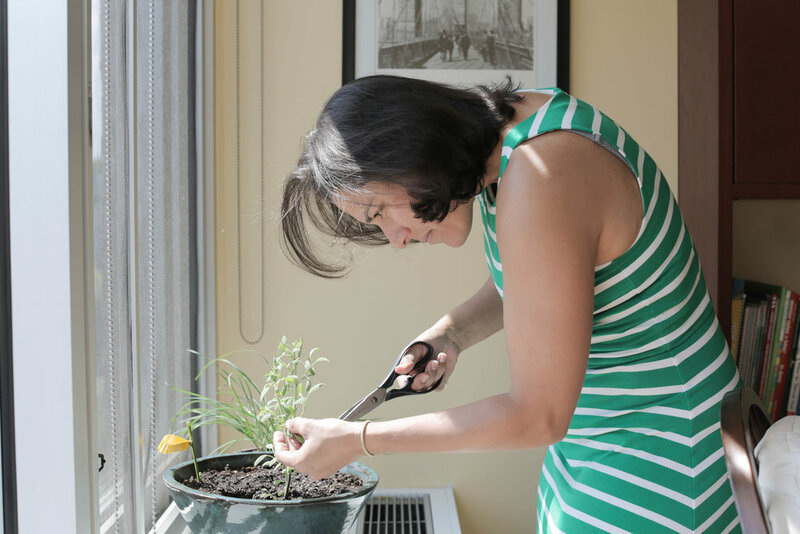 I spent hours one Sunday watching countless youtube videos about harvesting my herbs and then practiced, scissors in hand checking the computer screen over my shoulder. I'm so glad I did. This year, all of my herb plants inside and out, even those most difficult to grow for me, like cilantro and sage, flourished. So, now, per the instructions on all those youtube videos, I'm pruning my herb plants like crazy to encourage their continued growth. Since we can't really predict when this river of herbs might suddenly dry up, my plan is to preserve as much as I can in as many ways as possible for later. Here's that same sage plant just a few weeks later. This recipe for herb butter is versatile and freezable. The measurements are just suggestions. For best results, make sure your herb leaves are completely dry. In fact, if I'm using herbs cut from my own plants, I don't even wash them. If you must wash the herbs, be sure to shake off the excess water and dry them thoroughly on a clean kitchen towel before mincing. This herb butter is perfect for making garlic bread, seasoning a whole chicken to roast, or topping some freshly steamed green beans. What will you use it for? Please share in the comments. With a wooden spoon, thoroughly mix garlic, herbs, pepper and salt into the butter. Stir until evenly combined. Transfer to a glass jar to store herb butter in your fridge for about 2 weeks or wrap tightly in plastic wrap and freeze for up to 6 months. I used to freeze this butter in small silicone or plastic containers, but learned the hard way that the garlic flavor never really washed out afterwards, so I've switched to storing in plastic wrap.